Greetings from green and lush Calhoun County! If rain makes grain, we’re on track for a good crop this fall. In our area, we saw anywhere from 8 to 10 inches in rain in June. However, I was so sorry to see the horrible flooding in other parts of the state. The rain delayed our hay cutting in my pasture. The rain has also made it tricky to get into the fields on time to control weeds, which are growing just as fast as the crops. Weeds are the enemy of any farmer or gardener. Weeds must be managed, because they steal water and nutrients from the crop. They can also harbor diseases and pests. Even worse, weeds that go to seed can lead to many more weeds that could take root next year. One of the most troublesome weeds is waterhemp. Here’s a scary fact I learned from Bob Hartzler, an Iowa State University Extension weed specialist and agronomy professor. If waterhemp plants are allowed to grow 6 to 12 inches above the soybean canopy, studies have shown that each plant can produce 21,000 seeds. If waterhemp is allowed to grow 2 to 3 feet over the canopy, each weed can produce a whopping 124,000 seeds. If all those seeds are allowed to enter the weed seed bank in the soil, weed control in your fields will become exponentially tougher. While we jump in our John Deere Gator and spray weeds in the fencerows, we hire the local farmer-owned cooperative to apply crop protection products to our fields. They have the latest equipment and can get the job done fast. The applicator was finally able to get into our corn and soybean fields by late June and early July. Watching the corn grow tall reminds me of the old saying “knee high by the Fourth of July.” As you can see in the photo of me by our cornfield, today’s corn hybrids from improved seed are well beyond knee high. 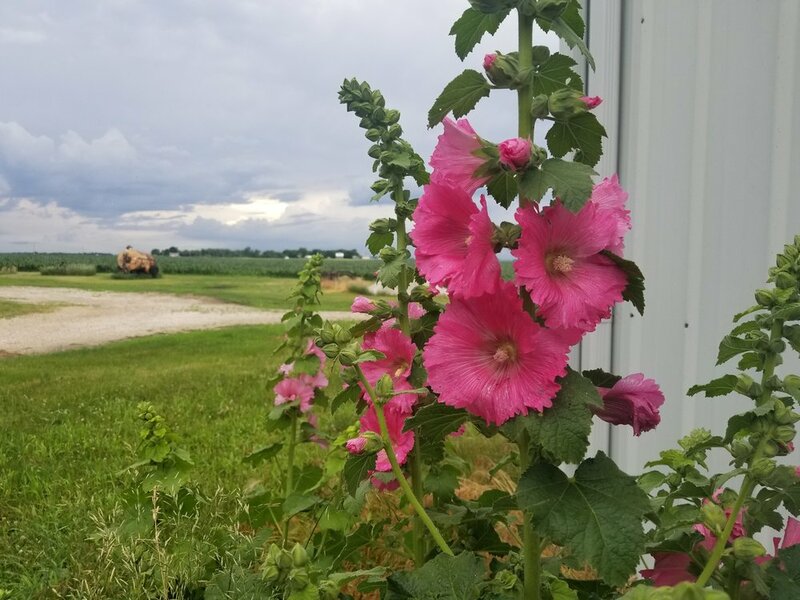 While weeds are bad news, there are some plants on the farm that I want to go to seed, like old-fashioned hollyhocks. Chances are you’ve seen these beauties alongside a barn, or maybe in a cottage-style garden. These stately towers of flowers bloom for a long time in summer in a wide variety of colors, from pink to white. Hollyhocks are easily 3 feet tall or higher and put on quite a show. The ones growing in our barnyard and by our machine shed have been on our Century Farm for years. Not only can you enjoy the beauty of hollyhocks, but you can make hollyhock dolls from their blooms. 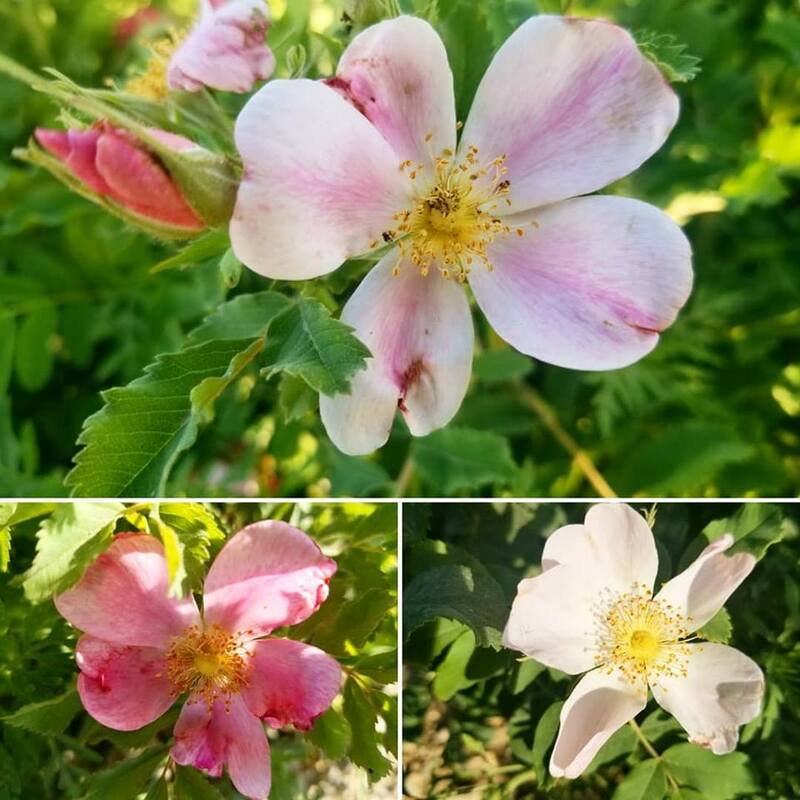 I was also excited to see wild roses (Iowa's state flower) blooming along the gravel roads in June. I spotted some not far from my house when I took Maggie the Red Heeler for a walk. I'm always amazed by the spectrum of whites, pastel pinks and hot pinks, as well as striped petals and solid petals, that burst forth from these inconspicuous plants. It’s amazing’ how much habitat grows along our country roads. Maggie discovered a big bumble bee and a butterfly by a milkweed plant and other blooming plants. The fragrance around here was so sweet and enticing, I can see why pollinators like them. Maggie and I enjoy other pleasing sights along our walks, like classic tractors on the neighbor’s farm. I wish everyone had the chance to see rural Iowa up close. Hint: Iowa’s rural roads make for beautiful and interesting excursions! One great way to see rural Iowa is to visit a small-town parade. On June 23, my hometown of Lake City held its annual Western Days parade, which is a little slice of Americana. If you stayed for the rodeo that evening, it was worth of trip past the Lake City town square to see the beautiful fountain. When it’s lit up at night, this icon looks like it could be in Europe, not Iowa. I invite you to visit Lake City sometime. In fact, why not plan an Iowa road trip this summer? When I give talks related to my book, “A Culinary History of Iowa,” I get to visit cities and towns all over the state. In June, I spoke in northeast Iowa at New Hampton’s Carnegie Cultural Center, which has a great Kitchen-Klatter cooking/food/apron exhibit on display through July 26. Kitchen-Klatter was a magazine published in Iowa from the 1930s through the late 1980s. It built on the success of the radio homemaker shows broadcast from KMA in Shenandoah and was devoted to serving rural and urban homemakers. The monthly magazine always included some great recipes. I always say the ladies from southwest Iowa (including Leanna Field Driftmier), who were the driving force behind Kitchen-Klatter and its associated kitchen products were the Martha Stewarts of their day, long before there was Martha Stewart. Speaking of food, a producer with Travel Channel’s Bizarre Foods: Delicious Destinations contacted me in June. The show is looking at doing a Des Moines episode in their upcoming season. The producer had bought my “Culinary History of Iowa” book and said she'd love to get my opinion on the must-eats that make Des Moines and Iowa so special. It sounds like the Travel Channel will start filming in Iowa this summer. It's fun to be part of the process, and Iowans can be proud of the national attention our food scene has created! I wonder if the film crew will visit the Downtown Des Moines’ Farmers' Market? “Tis the season to enjoy fresh vegetables of all kinds. 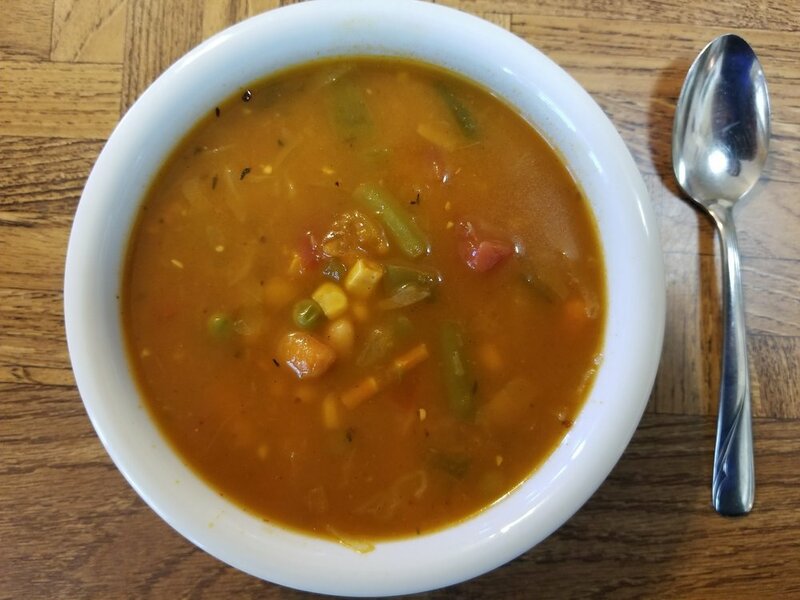 Vegetables star in one of my go-to recipes — Hearty Garden Vegetable Soup. If you’re like me, you love a good soup any time of the year. To make good soup, you need good water. Next time we talk, I’ll share stories from the One Water Summit I’m attending in July with other farmers, along with water-quality specialists in Minneapolis. I’m looking forward to discussing a sustainable water future for us all. Reduce heat; simmer, covered, until vegetables are tender, 1 to 1-1/2 hours. Remove bay leaves.